Obtaining a pet passport for your dog, cat or ferret can seem daunting. Here are some facts and pointers about the scheme that will help you get your pet overseas and home again without facing quarantine. 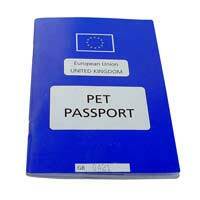 Did you know that the Pet Passport is unlike our own passports, as it is only needed when re entering the UK? The scheme works between EU member countries and DEFRA is consistently updating the list of participating countries. The Department for the Environment, Food and Rural Affairs (DEFRA) control the rules of the PET TRAVEL SCHEME, which is more commonly known as the PET PASSPORT. It is now ten years since a pug dog called Frodo was the first pet to travel under the Pet Travel Scheme in 2000. Since Then over 600,000 pets and their owners have made use of the scheme. 1. Microchip your pet. Use a qualified person and make sure that the information registered with the chip is correct. 2. The rabies vaccine must be given AFTER the pet is micro chipped, as the information on the chip needs to be shown on the vaccine certificate. Make a note of the date for the following year’s booster. 3. Next is the blood test to check that the rabies vaccine has worked. Once this is successful your countdown to travelling begins. You are able to travel with or pet SIX MONTHS from this date. 4. If the above has proven satisfactory then you can apply for your EU Pet Passport. 5. Your dog needs to be treated against ticks and tapeworms. This is done within a very tight window of time when re entering the UK after your overseas trip. It must be done between 24 and 48 hours. Did you know that your vet could help you through the requirements of the Pet Passport? This is a great help to the many people that are confused by the time restraints and paperwork. Many people who travel overseas regularly have their own scanners to check the micro chips in their pets. It has saved many a pet from six month’s quarantine when the scanner at immigration fails to work. Yes, your dog will have to go into a quarantine kennel in the UK if your pet’s paperwork is incorrect or the chip does not scan correctly. This is a considerable expense to the pet owner and can cause distress to the pet that will have limited access to visits from owners over the next six months. Owning a pet passport does not allow the pet to sit with its owners. Travelling by sea will mean either staying in the vehicle or in a small area in the hold. Air travel will be in the hold of the plane and in a secure container that is checked in upon leaving and arriving at airports. Quite often officials will pass the scanner to the owner of the pet to avoid stress and worry to the animal.